Lambeth (/ˈlæmbəθ/ ( listen)) is a London borough in south London, England, which forms part of Inner London. Its name was recorded in 1062 as Lambehitha ("landing place for lambs") and in 1255 as Lambeth. The geographical centre of London is at Frazier Street near Lambeth North tube station, though nearby Charing Cross on the other side of the Thames in the City of Westminster is traditionally considered the centre of London. For the borough's history from 1900 to 1965, see Metropolitan Borough of Lambeth. Lambeth was part of the large, ancient parish of Lambeth St Mary, the site of the archepiscopal Lambeth Palace, in the hundred of Brixton in the county of Surrey. It was an elongated north-south parish with 2 miles (3.2 km) of River Thames frontage opposite the cities of London and Westminster. Lambeth became part of the Metropolitan Police District in 1829. It remained a parish for Poor Law purposes after the Poor Law Amendment Act 1834, and was governed by a vestry after the introduction of the Metropolitan Board of Works in 1855. Until 1889, Surrey included the present-day London borough of Lambeth. When it drew the boundaries for the London boroughs, the government initially suggested that the Metropolitan Borough of Lambeth and the Metropolitan Borough of Southwark be merged into a new borough; the southern and eastern sections of the Metropolitan Borough of Wandsworth (including Clapham, Streatham and Tooting) would form another. South Shields town clerk R.S. Young was commissioned to make final recommendations to the government on the shape of the future London boroughs, and he noted that the Wandsworth council opposed the partition of their borough. However, Wandsworth's suggestion to merge Lambeth with the Metropolitan Borough of Battersea was rejected by both councils involved. Young believed that residents of Clapham and Streatham would be more familiar with Brixton than with Wandsworth, and recommended a new borough formed from the Metropolitan Borough of Lambeth and six wards and portions of two others from the Metropolitan Borough of Wandsworth. In 1979, the administration of Edward ("Red Ted") Knight organised the borough's first public demonstration against the Thatcher government. In 1985 Knight's Labour administration was subjected to rate-capping, with its budget restricted by the government. Knight and most of the Labour councillors protested by refusing to propose budgets. As a result of the protest, 32 councillors were ordered to repay interest lost by the council due to budgeting delays and were disqualified from office. In 1991, Joan Twelves' administration failed to collect the poll tax and opposed the war in the Persian Gulf. The following year, Twelves and 12 other councillors were suspended from the local Labour Party by regional officials for advocating non-payment of the poll tax and other radical ideas. Twelves' equally-militant deputy leader at this time was John Harrison. From 1978 to 2002 the council comprised 64 members, elected from 20 three-member and two two-member wards. Before this, the council had 60 members elected from 20 three-member wards. Just before the 2010 election, its political balance was 37 Labour members, 18 Liberal Democrats, seven Conservatives and one Green, giving Labour an eleven-member majority. In the 2010 Lambeth Council election, Labour gained seats and the Liberal Democrats, Conservatives and Greens lost seats. In 2014 the Liberal Democrats lost their seats, Conservatives were reduced to three and the Greens to one. Labour, gaining seats from the Conservatives and Liberal Democrats, had 59 seats. In the 2016 European Union referendum, Lambeth at 78.62% had the highest share of Remain votes in the United Kingdom, second to overseas territory Gibraltar's 95.9%. Lambeth is a long, thin borough, about 3 miles (4.8 km) wide and 7 miles (11 km) long. Brixton is its civic centre, and there are other town centres. The largest shopping areas are (in order of size) Streatham, Brixton, Vauxhall, Clapham and West Norwood. In the northern part of the borough are the central London districts of the South Bank, Vauxhall and Lambeth; in the south are the suburbs of Gipsy Hill, Streatham, West Dulwich and West Norwood. In between are the developed and inner-city districts of Brixton, Brixton Hill, Streatham Hill, Clapham, Clapham Park, Herne Hill, Stockwell, Tulse Hill and Kennington, which are each at different stages of gentrification and have suburban and urban elements. Vauxhall and South Lambeth are central districts in the process of redevelopment with high-density business and residential property. Streatham is between suburban London and inner-city Brixton, with the suburban and developed areas of Streatham, Streatham Hill and Streatham Vale. Despite the borough's population density, Lambeth has open spaces. They include Brockwell Park and Lido, Streatham Common, half of Clapham Common, West Norwood Cemetery, Archbishop's Park, Norbury Park, Vauxhall Pleasure Gardens and Ruskin and Larkhall Park and Kennington Parks. Along and around the South Bank, a tourist area has developed around the former Greater London Council headquarters of County Hall and the Southbank Centre and National Theatre. Also on the river is the London Eye and Shell Centre. Nearby is St Thomas' Hospital, Lambeth Palace and the Florence Nightingale Museum. A landmark in the centre of the borough is the Art Deco Sunlight Laundry on Acre Lane. Nearby is Brixton, home of Lambeth Town Hall and the Brixton Murals. The Oval cricket ground in Kennington is the home of Surrey County Cricket. The Basaveshwara statue at the Albert Embankment erected by the Former Mayor of Lambeth Cllr Dr Neeraj Patil was unveiled by Prime Minister of India on 14 November 2015. Since 2002, Lambeth Borough Council has had 63 members elected in 21 three-member wards by means of a plurality bloc voting system. The wards are Bishop's, Brixton Hill, Clapham Common, Clapham Town, Coldharbour, Ferndale, Gipsy Hill, Herne Hill, Knight's Hill, Larkhall, Oval, Prince's, St Leonard's, Stockwell, Streatham Hill, Streatham South, Streatham Wells, Thornton, Thurlow Park, Tulse Hill and Vassall. Since 1994 the mayor of Lambeth has been elected unanimously by their fellow councillors, with each of the three political parties supplying a candidate in rotation. According to the borough's website, this underscores the mayor's apolitical role and enables him or her to represent all the borough's citizens. The council is run by a leader and cabinet, chaired by council leader Lib Peck. All cabinet members are from the ruling Labour Party. The leader of the opposition is Scott Ainsle (Green), which includes Green Party Co-leader Jonathan Bartley and the leader of the Conservative opposition is Timothy Briggs. The chief executive is Andrew Travers. The borough's coat of arms is that of the former Metropolitan Borough of Lambeth, with two gold stars (mullets) in the second and third quarters of the shield indicating the addition of the districts of Clapham and Streatham. Its motto is "Spectemur agendo" ("Let us be judged according to our conduct"). The borough has three Parliamentary constituencies: Dulwich and West Norwood (shared with Southwark), Streatham and Vauxhall. The former Metropolitan Borough of Lambeth and its successor have been twinned with the Vincennes district of Paris in France since 1955. Lambeth is also twinned with Bluefields, Nicaragua; Brooklyn, New York; Shinjuku, Japan and Spanish Town, Jamaica. The borough contains the London Waterloo railway station, the Waterloo tube station network and (until 2007) the London terminus for Eurostar. National Rail service in Lambeth is provided by South Western Railway, Southeastern, Southern, Govia Thameslink Railway and London Overground. In March 2011, the primary forms of transport borough residents used to travel to work were the London Underground, metro, light rail or tram (21.4 percent of residents aged 16–74); bus, minibus or coach (10 percent); train (10 percent); automobile (8.6 percent); bicycle (5.7 percent), or walking (5.4 percent). A small percentage (3.2 percent) worked mainly at—or from—home. ^ BBC. "Where Is The Centre Of London?". ^ a b Youngs, Frederic (1979). Guide to the Local Administrative Units of England. I: Southern England. London: Royal Historical Society. ISBN 0-901050-67-9. ^ "London Government: The London Boroughs", Ministry of Housing and Local Government, HMSO, 1962. See in particular paragraphs 51–57. ^ a b c "The rise and fall of Red Ted's loony lefties". 29 July 1995. ^ a b Kate Hoey MP and Lambeth Labour Party – Brian Deer investigates. Briandeer.com (8 August 1993). Retrieved on 17 July 2013. ^ Bennett, Will (29 July 1995). "The rise and fall of Red Ted's loony lefties". The Independent. ^ GLATUC News. Glatuc.org.uk. Retrieved on 17 July 2013. ^ "EU referendum: full results and analysis". The Guardian. 24 June 2016. ^ "Lambeth: Total Population". A Vision of Britain Through Time. Great Britain Historical GIS Project. Retrieved 6 September 2011. ^ "Ethnic Group by measures". NOMIS. Retrieved 2 September 2014. ^ "2011 census - theme tables". Retrieved 5 September 2014. ^ De Peyer, Robin. "Tributes flood in for Lambeth Mayor Mark Bennett, who has died suddenly aged 44". London Evening Standard. 5 February 2014. Retrieved 22 April 2014. ^ "The Mayor, the leader of the Council and Cabinet members – guide". Lambeth Council. 23 May 2018. Wikimedia Commons has media related to London Borough of Lambeth. 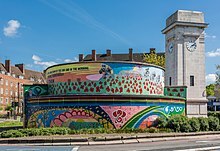 Wikivoyage has a travel guide for Lambeth. Community Police Consultative Group for Lambeth Independent forum for community and statutory agencies to address community safety and policing issues.